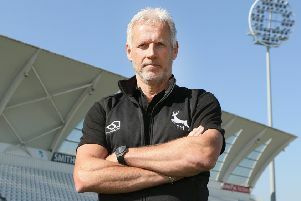 Mick Newell, Nottinghamshire's director of cricket, who says James Pattinson can bowl at more than 90mph. Exciting Australian pace ace James Pattinson will be the fastest bowler ever to operate at Welbeck Cricket Club’s Sookholme Road ground when Nottinghamshire host a match there next month. That’s the view of the green-and-golds’ director of cricket Mick Newell, who says he is relishing the club’s return to the north of the county for their annual outing at the John Fretwell Complex. Notts take on Leicestershire in the 50-over Royal London Cup on Sunday, May 7, and Pattinson, who made an explosive debut for the club in the County Championship at the weekend, is almost certain to play. The 26-year-old Aussie, who has followed the footsteps of his older brother and former England seamer Darren into Trent Bridge, has agreed a deal until the end of June. And the quickie, who already has 70 Test wickets to his name at an average of 26.15, could well cash in on a Welbeck wicket that often offers pace and bounce. “James is capable of bowling at more than 90mph,” said Newell. “He’s certainly the quickest bowler in our attack this year, and I think it will be quite a sight to see him charging in at Welbeck.